Starting at Mars Candy Co. in 1930 under his Uncle Tom Dattalo, my father learned everything from candy making to repairing machinery. He often teased me by saying, “I forgot more about candy making than you’ll ever know.” So after spending the next seventeen years at Mars, then two years in the Marines, and two more years at Mars, he was having dreams of someday owning his own candy company. In 1949, the Mars family was in a takeover position within the family. This forced my father to make a decision. He didn’t like the second-generation takeover policies at Mars, so he left as a foreman and moved back to Minnesota to work with his brother at The Hopkins Candy Company. They started off slowly but gradually built up business. Their timing was just a little off as a recession took its toll and the business was forced to close. Having lost nearly everything, my father took a job at Candy Masters in Minneapolis,and then left to work in another candy company, Gene Garretts Candy Company of St. Paul. It was then by chance that a nut-broker knew both my father and Joe Lopp, the first person to open a fudge store in Wisconsin Dells. 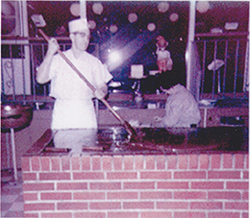 Joe was never a candy maker and always had trouble with the consistency of his fudge. So Joe contacted my father, who developed a schedule of working his regular job from 6am-4pm Monday through Friday, and be on the road Friday night heading to Wisconsin Dells to tutor and demonstrate the fudge-making process. Then Sunday night it was back to Minneapolis to work Monday morning at his regular job. Soon our family began making the trip, which exposed my sister Debbie and I to the work at a young age. In 1962, my father heard of “Old Town,” a touristy place in Chicago. 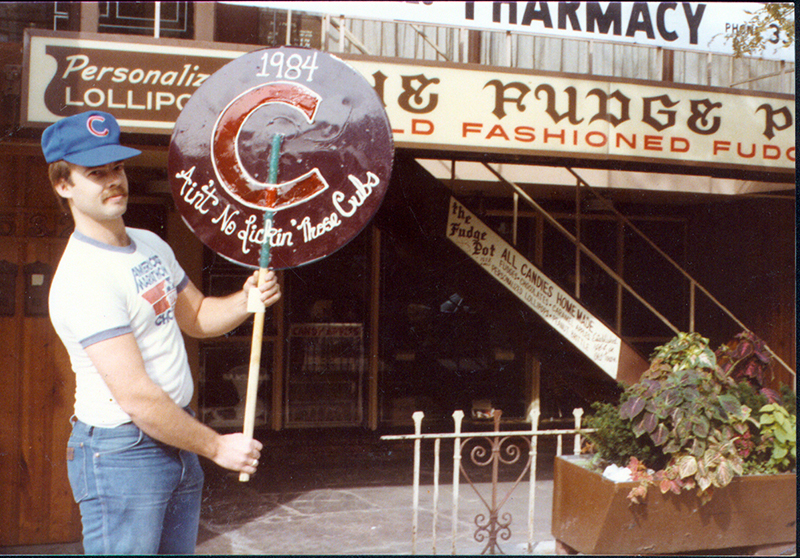 So Joe Lopp and my father met in Chicago to investigate a potential fudge store. Joe, my father, and a third candy maker in Chicago, Wally Warsaw, then began to develop plans for a new store in Old Town. The Fudge Pot was born. 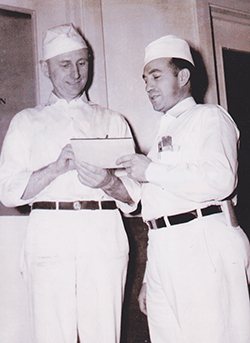 Differences in management opinions led to Joe Lopp selling his stake in the business to my father and Wally after the first years of operation. For the next few years, sales were stagnant. My father couldn’t understand why sales were so flat except when my family would come in from Minneapolis to Chicago for weekends to give Wally a break for the weekend. Those weekends, the business couldn’t have been better. People were coming into town from all over the country to visit this unique area of the city. My father realized he had to be in Chicago if his business was to succeed, and at the age of sixty-three, we sold our home in Minneapolis and moved to Chicago. My father now was able to have a first hand view of the business. That was 1967, and by 1968, things had really changed. The Democratic Conventions was in Chicago with many protesting the Vietnam War, the country saw Bobby Kennedy and Martin Luther King assassinated, which put a strain on the community. The business partnership with Wally was also becoming uneasy. Wally offered to sell my father his portion of this business and give him sole ownership of the company, which he accepted. In 1976, I was ready to take over the business, continuing to introduce new candies to our store in the heart of Old Town. The community has changed since we first opened our doors. The neighborhood has gone through many transformations into what it is today, and employees have stayed for short seasons and multiple decades. Continuing our tradition as a family business, my son has become interested in the field of candy making and began working with me shortly after my father’s passing. In 2011 we participated in our first Taste of Chicago festival, after my son worked with my father-in-law at the Aunt Diana’s Candy Makers booth that had participated in the festival since its first year in 1980. We love candy, we live candy, and we treasure the beautiful community in Chicago that we have become a part of. We’ve sold our passion in the same location for over 50 years, and hope to do so for at least 50 more.